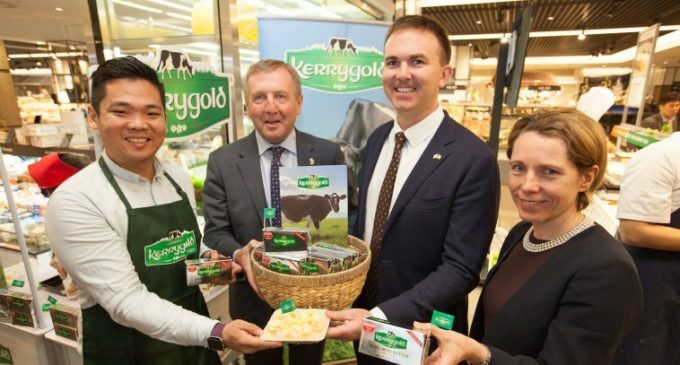 Ornua, Ireland’s largest exporter of Irish dairy products, has announced a major product expansion into the South Korean market with the launch of Kerrygold butter. Kerrygold will be sold through major Korean retailers. Kerrygold dairy products, made from the milk of grass-fed cows, will bring a unique new offering to South Korean consumers. Korean consumers place a high value on the origin and quality of their food. Its dairy market is characterised by very high-quality standards. The announcement of Kerrygold’s entry into the South Korean market is the latest step in Ornua’s growth in Asia, a key market for Irish dairy. In recent years, Ornua has introduced products in China, Singapore and Malaysia. As milk deficit regions, these countries offer significant potential as a route to market for Irish dairy exports. Kerrygold reported record annual retail sales of €900 million in 2016. Ornua’s ambition is to move Kerrygold from being a world-class butter brand to an instantly recognisable €1 billion global dairy brand in the coming years. 2016 saw the successful launch of Kerrygold Yogurts in Germany, Kerrygold Spreadable in the UK and the continued roll-out of Kerrygold Irish Cream Liqueur across Europe and the US. South Korea is the 11th largest economy in the world, with a GDP of €1.2 trillion and a growth rate of 3.3%. The country has a population of over 51 million and is heavily urbanised, with over 82% of the population living in cities. Consumption of dairy produce is rising fast in South Korea, as the economy mirrors trends in other neighbouring countries. Agriculture accounts for just 2.2% of GDP. South Korea currently imports 150,000mt of cheese and butter. Pictured at the launch are (L-R): Vincent Tong of Ornua; Minister for Agriculture, Food and the Marine, Michael Creed TD; Sean Ryan of Ornua; and Tara McCarthy of Bord Bia.